The Hillsborough County Extension Service has prepared a new online manual to creating a rain garden in your yard. Following the principles and practices of Florida-Friendly Landscaping, this new rain garden manual walks you through the steps of identifying if a rain garden is right for you, where to put it, how to construct it, and what plants to use. The last few pages contain a suggested plant palette with color photos to help make the process a little easier. 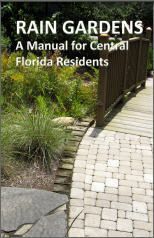 Click here to read/download "Rain Gardens: A Manual for Central Florida Residents"